A Nurturing Parenting Program (NPP) adapted format for Kings County youthful parents (teens and transitional aged adults). CYPP will be delivered in both a group office setting and home-visitation setting. CYPP aims to address risk factors for youthful parents, such as dynamic criminogenic factors, intergenerational maladaptive patterns, employability and education, and improved health and wellness. 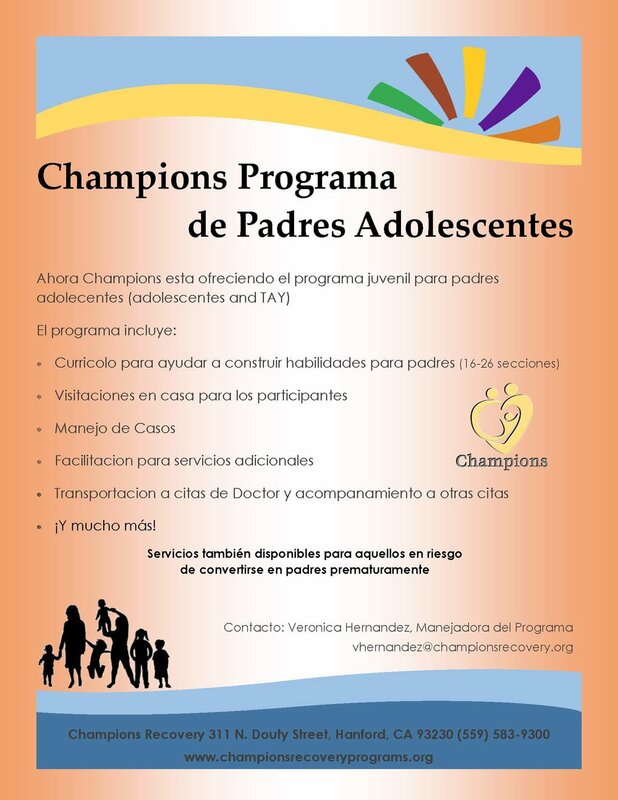 Champions provides several parenting programs for all types of parents and families. Our services focus on strength-based trauma-informed care, inclusive of psychoeducation, process, and therapeutic interventions. We would love to walk along side of parents in their journey to be a healthier, stronger, and more productive unit. Parenting programs utilize pre and post measures to assess parenting attributes, risks of neglect and abuse, and parental styles. Please contact us for more information at (559) 583-9300.